Baseball's annual amateur draft is rapidly approaching. The three-day event begins Monday, June 4, and will cover 40 full rounds plus four shorter supplemental rounds for free agent compensation and competitive balance picks. As always, MLB Network will broadcast the first night of the draft live. This year, the first 78 picks will be broadcast. Two weeks ago we compiled a first-round mock draft based on the latest rumors and industry chatter. Now, with the draft only one day away, it's time to update our mock draft based on the latest information. Baseball's draft is very difficult to predict, so this is all little more than educated guesswork. Here is our latest -- and final -- 2018 MLB mock draft. The Tigers have done their due diligence and heavily scouted all the top prospects in this year's draft class. There is no slam dunk No. 1 prospect this year, a Bryce Harper or Stephen Strasburg type, but Mize has emerged as the best player available thanks to strong performance, a big-league frame, and swing-and-miss power stuff. Detroit tends to be very aggressive with their top prospects, and if they wanted, they could stick Mize in their MLB bullpen later this year a la Chris Sale and Brandon Finnegan. Both Sale and Finnegan were recent first-round picks and college starters who were in the big-league bullpen a few weeks after the draft. Teams do not draft for need in the first round, especially not this high, so the presence of Buster Posey will not prevent the Giants from taking Bart here. He's a complete package behind the plate with middle-of-the-order offensive potential and a very good reputation for guiding a pitching staff. The Giants would jump all over Mize should the Tigers buck the consensus and take another player with the No. 1 selection. The Phillies are in finger-crossing mode right now. They're hoping either Mize or Bart will still be on the board for this pick. If not, they've been most linked to Bohm, a devastating offensive player with some defensive questions. 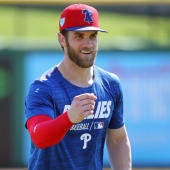 As with most teams at the top of this year's draft, the Phillies are looking at college players primarily, with a bat more likely than an arm. Generally speaking, the White Sox target college players early in the draft, and they're not afraid of unconventional players. Oregon State infielder Nick Madrigal, who is listed at 5-foot-7, has been most closely associated with the ChiSox this spring. Now it appears they're more focused on pitching, and Singer was No. 1 pitching prospect in the draft class before Mize broke out. In a sense, the Reds have the easiest decision in the draft. Bart, Bohm, Madrigal, Mize, and Singer are the top five players on the board, and they're all expected to be taken within the first five picks. The Reds will simply take whichever one of those players is still available, and in our mock draft, that's Madrigal, an undersized hitting machine and one of the "safest" players in the draft class. The Mets tend to go after top college performers high in the draft, and after being connected to college bats for weeks, it appears their focused has shifted. They're now closely linked to Kelenic, one of the draft's biggest risers and a possible candidate for an under-slot deal. New York would be able to sign him below his $5.5252 million slot value and use the savings for an over-slot bonus with their second-round pick. Not an uncommon strategy at all. With so many college players coming off the board in the first six picks, the Padres will have their choice of high-upside high schoolers here, and that is right in GM A.J. Preller's wheelhouse. Even after forfeiting their second-rounder to sign Eric Hosmer, San Diego has two extra Competitive Balance picks, and the smart money is on them selecting whichever prep arm agrees to a below-slot bonus here, then using the savings on their extra picks later. Liberatore is considered the strong favorite to be the first prep pitcher taken Monday. Aside from Mize and the Tigers, no player has been more closely linked to a specific team these last few weeks than Gorman and the Braves. They've scouted him extensively and Gorman has arguably the most raw power in the entire draft class. If, for whatever reason, one of the top college prospects is still on the board here, the Braves would pounce. This would be a dream scenario for the Athletics, who would want upside and would prefer a college player over a high schooler. India is one of the top all-around hitters in the draft class and he's athletic enough that whichever team drafts him may have him start his pro career at shortstop. A position player is more likely than a pitcher here. The Pirates have been in on high school pitchers all spring, and getting Stewart here would be a fine outcome. He and Liberatore are the top two prep pitchers in the draft class and Pittsburgh would be happy to take either guy here. Stewart is a high-upside righty with a power arsenal and a big 6-foot-6 build that looks cut out for 200-inning seasons. With both Stewart and Liberatore off the board here, the Orioles move on to take Winn, third on their prep pitcher board. They've been in on all the top high school pitchers after being connected to college arms previously. The O's haven't had much success developing pitchers lately but they keep trying, and they keep drafting kids with considerable upside. Winn fits. The Blue Jays have been in on college pitching all spring and, in our mock scenario, they'd have their pick of anyone except Mize and Singer here. Gilbert was a potential top-10 pick coming into the year -- he was a possible top-five pick at one point -- though an inconsistent spring has him sliding down draft boards. He offers as much pure upside as any college pitcher in the draft class aside from Mize and Singer. The Marlins are difficult to pin down because they have new ownership and a new front office, and thus no real track record when it comes to draft preferences. McClanahan is the best player still on the board here. A hard-throwing lefty with an out-pitch changeup is never a bad pick. The Mariners and college players are one of the draft's longest ongoing romances. They'd love India to slip here, though that seems very unlikely. Larnach is the best college hitter still on the board and that makes him a natural fit for Seattle given their draft history. As always, the Rangers are in high school players, and it's unlikely they'd pass on Kelenic should he still be on the board at this point. Texas could be the stopping point for Stewart as well. Since both have already been taken in our mock draft, Weathers is the pick here. He's the son of former reliever David Weathers and is as advanced as you'd expect the son of a longtime big-leaguer to be. With three extra picks and a large bonus pool, the Rays are in position to get creative here. The latest chatter has them signing a player below-slot here and really going big for a top talent who falls with one of those extra picks. Rodriguez, who is a legitimate first-round talent and expected to come off the board in the top 20 picks somewhere, is a prime candidate for such a maneuver. It is college pitching all the way with the Angels, and since Gilbert and McClanahan are off the board in our mock draft, this choice probably comes down to Rolison and Florida righty Jackson Kowar. Rolison, a lefty with good velocity and arguably the best curveball in the draft, is the pick here. The Royals have three extra picks this year thanks to their free agent defections, and thus the bonus pool flexibility to spend big now or later. Adams is one of the most tooled-up players in the draft class and he's also a top wide receiver recruit, giving him extra leverage. Kansas City is one of the clubs best equipped to meet his bonus demands. If Adams is still on the board after this pick, he'll either be a target for a team with extra picks and bonus pool space, or he's going to college. Gilbert or McClanahan would be the ideal scenario here for the Cardinals, who did not pick until the third round last year after forfeiting their first rounder to sign Dexter Fowler, and two other picks as part of the hacking scandal. They've been closely linked to college arms this spring and Kowar is the best still on the board here. The Twins have gone heavy on high school players in recent years and, at this point, Scott is the best prep hitter still on the board. He's a potential four-tool player -- there are some questions about his long-term power potential -- with the kind of high-end tools and athleticism Minnesota has been targeting in recent years. The Brewers are one of the most predictable teams when it comes to the draft. They use a very straightforward "best player available" approach with no regards for bonus pool shenanigans or anything like that. The best player still on the board in this mock draft is Rocker, who had a chance to go into the top 10-15 picks before a few uneven outings late in the spring. Although they tend to focus on pitching in the early rounds, the latest buzz has the Rockies on high school position players, and they've been all over Seigler in recent weeks. He's a pop-up guy, meaning he's raised his draft stock considerably in a small amount of time leading up to the draft. Hard to argue with a switch-hitting -- and switch-throwing! -- catcher who projects to provide offensive and defensive impact. Turang checks all the boxes for a top Yankees draft pick. He's from Southern California, he's an athletic up-the-middle player, and he's a top talent who slipped down draft boards. The Yankees usually focus on those traits. Turang went into the spring as the best high school prospect in the draft class and a potential No. 1 pick candidate. He hasn't had a great senior season at the plate, though his top notch tools remain intact. The Cubs have two extra picks this year and thus extra bonus pool money, though they are late picks after the second round, meaning it'll be tough to use them on a top talent that falls. Rather than take a below-slot player here and spend big later, the Cubs could spend big now and save later. Hankins has considerable upside and at one point was considered a potential top-five pick. A shoulder issue slowed him earlier this spring though, which took a bite out of his draft stock. This is a spot for the Cubs to land a top of a draft talent near the end of the first round. Given the available players at this point, a college bat seems most likely for the Diamondbacks, and McCarthy is one of the better college hitters in the draft class. He has a great track record at a top program and also showed well against elite competition in wood-bat summer leagues. McCarthy or a similar college bat here could give the D-Backs some draft pool savings to use later. Few college hitters in the draft class can match Beer's track record of excellence, and when picking late in the first round, the Red Sox tend to target high-end ability rather than well-roundedness. Beer can really, really hit. There's a good chance his long-term position is DH, however. Boston is the type of team to bet on the bat and let everything else figure itself out. It is not out of the question that Swaggerty could go in the top 10 picks. He had been considered one of the top college hitters in the draft class all spring, but a rough showing in the Sun Belt Conference tournament has hurt his stock. The Nationals almost always go after top players who slip (injuries, makeup, etc.) and grabbing Swaggerty here is right up their alley. The Astros are reportedly taking an analytics-heavy approach to this year's draft. They're said to be focusing on underlying skills like spin rate and exit velocity. Schnell is a late riser this spring and he has a well-rounded game that checks lots of boxes. He has speed, pop in his bat, and good defense. The Indians have an extra pick and some money to play with here, and they've mostly been connected to high school position players. Edwards fits their usual profile as a top-of-the-line, up-the-middle athlete. In this case, Edwards is maybe the fastest player in the draft class, he knows his game as a switch-hitting leadoff guy. The Dodgers have a thing for versatility, and Naylor is athletic enough to play first and third bases in addition to catching. He also has an intriguing power bat that is more about contact ability than power, unlike his older brother Josh, a first-round pick in 2015.